Oriental rugs can make a room really “pop”, whether the look you’re going for is formal, informal, or somewhere inbetween. Good quality oriental rugs are designed to last for many years, or even decades. It’s important to note that not all oriental rugs are the same. They are comprised of different structures, different fibers, some with fringe, some without, some with integral fringe, some with fringe that’s sewed-on, some are tufted, and others are woven. There is a lot to know about oriental rugs, but for purposes of this article I’m going to list the 5 things you need to know about oriental rugs. Original oriental rugs were first designed to be utilitarian. They were woven by hand from wool, camel or goat hair, sticks, coir, and whatever local materials the tribe weavers could scrounge up. The rugs were portable, allowing the owner to roll up the rug and carry it with them from place to place as they moved. These rugs were placed right on the ground inside of a yurt, cave, under trees, or under a shelter of some sort. There was no need for a pad underneath because the rugs were well constructed for utilitarian purposes and if they wore out over the decades, the weavers in the tribe would repair or sell/trade the owner a new one. Rugs were originally all about functionality. As ancient cultures evolved into modern, the oriental rug became less utilitarian for the masses and more stylish and used less as a necessity to keep the bugs and dirt off of the owner and more as a decorative accessory. Sizes became important for the non-Nomad because the rug had to fit in a room. Some rugs even today are installed wall-to-wall inside of a room, but in the modern home most rugs are of portable size. Rugs in western homes are placed over existing floor structures like wood, ceramic/porcelain, stone, or carpet. Modern oriental rugs have different kinds of foundations. Some are woven (by hand or machine) and the back of the rug somewhat mirrors the front of the rug. Other rug foundations are tufted, broadloomed, or sewn (ex: rag rugs and braided rugs). When placed over a floor in the home, ultimately sand, grit, and other contaminants will eventually fall down through the rug foundation and land on the floor beneath. As the rug is walked on by foot traffic, the rug moves slightly causing the sand and grit that has fallen through the foundation of the rug to etch and abraid the floor beneath. For this reason, every rug should have a pad sandwiched between the rug and the floor beneath. There are additional reasons a pad should always be used under a rug including lowering the chance of off-gassing from the rug to the floor, comfort, spill containment, and keeping the rug from moving around as it’s walked on. 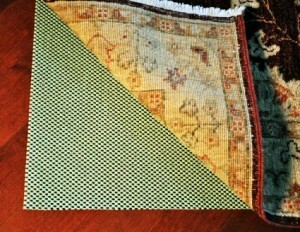 There are many styles of rug pads to choose from, but I’ll just cover the 2 we see most. faux horse hair & rubber backed rug pad – image credit: Oak Creek Rug Co.
Because of its sturdiness and longevity, our favorite type of rug pad looks like faux horsehair on the topside that comes into contact with the rug and has a rubber backing on the bottom to keep the rug from sliding around. 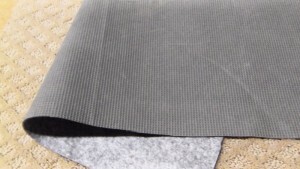 This style of rug pad also helps contain liquid spills from contacting the hard floor beneath. These faux horsehair rug pads can usually be professionally cleaned at least once every 2-4 years. There are other types of rug pads available including the very popular rubber waffle bead style pad. The thicker pads usually last longer and most of the bead/waffle style rug pads can be safely washed in a washing machine with cold water. Be sure to check the manufacturing label to ensure the rug pad can be safely washed before attempting, though. To maximize longevity of your oriental rugs, you should rotate them 180 degrees twice a year. The reason for this is because traffic on rugs is seldom even, meaning one of the sides generally get more traffic, sunlight, and wear and tear than the other. By rotating the rugs twice a year you effectively double the life the rug. If you have a flatweave oriental rug like dhurrie, kilim, soumak, hooked, etc., you should rotate the rugs 180 degrees every 6 months and flip them over every year. This way you’ll effectively quadruple the life of the rug by constantly changing the nap surface that is walked on. Not all flatweave oriental rugs are exactly patterned topside and backside, and some flatweaves are only designed to look finished on one side so you’ll have to take that into consideration when deciding if the rug should be flipped upside down. Either way, rotating the rug every 6 months should still be done. Out of all of the damage we see on oriental rugs that come in for cleaning and repairs, the number one issue we see is fringe damage caused by the homeowner or maid service vacuuming the rug. If you must vacuum fringe, be sure to use only the hose attachment without a beater bar. Not only do beater bars weaken the fringe by excessive dry agitation, oftentimes the beater bar will gobble up the fringe into the rubber vacuum belt causing fringe calamities like shredding, fringe fiber loss, burning, and rubber from the belt melting into the fringe fibers. Please do not ever use a beater bar on your fringe. There are many reasons why a rug might smell bad including biocontamination (urine, feces, water damage), latex off-gassing, fungi growth, and several other reasons. Tufted rugs, in particular, are notorious for having bad odors due to the use of inferior latex. If you have a relatively clean rug -or even new rug- that smells like diesel fuel, poop, urine, sulfur, or something rotting, flip it over and sniff the backing. If it smells evenly bad all over the backing, chances are the malodor is coming from the latex glue that holds the scrim (cotton backing) on to the tufted fibers. Most of the rugs with sour latex odor come from India, so if the rug has a tag check the country of origin. If the rug is newer, it’s best to contact the retailer and let them know. Oftentimes they’ll replace it for you at no cost. When a true wool rug gets wet, the odor is often compared to that of a wet dog. This is a normal odor of wool rugs and this “wet dog odor” goes away when the rug is dry. 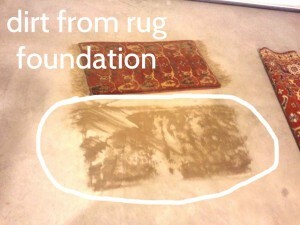 Oriental rugs have an amazing ability to hide soil deep down in the foundation. As I mentioned above in item 1., gravity causes grit, sand, and dirt to flow through the fibers, into and through the backing where the contaminants eventually land on the floor beneath. Your rug foundation is essentially a big grid with lots of nooks and crannies for this dry soil to hang out. 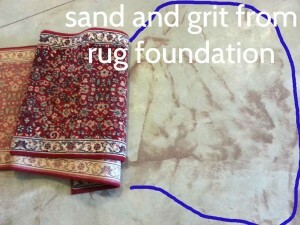 As you walk on the rug that has perhaps pounds and pounds of sand and grit in it (that you cannot see from the top) the sharp edges of the sand, grit, and dirt etch the fibers which contributes to foundation damage, fringe damage, pile distortion, fiber loss, and a whole host of avoidable problems. Frequent vacuuming (once a week) surely helps to remove this dry soil, but vacuuming alone does not remove all of the contaminants. Also vacuuming does not remove sticky soils that accumulate over time like kitchen oils, pet oils, urine, vomit, and feces, skin oils and flakes, spills, tracked-in petroleum pesticides, herbicides, wild animal and bird droppings, etc. Therefore your rugs should be professionally cleaned at least every couple of years to release and remove this ground-in soil from the foundation. The more traffic and abuse a rug receives, the more often it needs to be cleaned. It is not unusual for us to clean some clients’ rugs every 6 months because they get a lot of use out of their rugs. For more on our rug cleaning, please visit our Rug Cleaning Page.